After releasing to over 30 countries, Pokemon GO [Free] is now available in Canada via the App Store & Google Play. Remember that your phone needs to have internet data in order for the game to function. Keep in mind that our network will offer Pokemon GO Plus accessories to several of our readers through our Giveaways page, so stay tuned with the page. Now let us go over Pokemon GO and its content below for those that missed out on our previous articles. The game is a free-to-play title and contains microtransactions ranging from $0.99 to $99.99. It is not a requirement to spend but it does make your gaming experience more convenient. There is also the Pokemon GO Plus, a $34.99 priced accessory which notifies you of nearby Pokemon by vibrating and a utility that can be used to catch them even. This accessory is not required either but it does save battery on your device instead of keeping the app active all the time. The game contains the 1st generation of Pokemon creatures and other generations will be introduced as the game gets updated. Niantic provides a pro-social experience by having you go out into the world to find and catch Pokemon. Each Pokemon can be found in its related environment so expect to find a Dratini near a lake or sea. One wonders if we must go near a volcano to find a Magmar! In terms of trading, since there is no trading process in Pokemon GO, evolving Pokemon can require the help of rare candies. For instance, if you want to evolve a Charmander to a Charmeleon, you will need 25 Charmander candies. No worries though, Niantic has confirmed that trading will make its way to the game at a later date. Players can also evolve their Pokemon, and even collect Pokemon Eggs, which will hatch into Pokemon after you have walked a preset distance. As we mentioned previously, gyms will require that you commit to a team: Team Blue, Red, or Yellow. Once you battle and win a gym leader, you become the new gym leader with your Pokemon team holding the gym to fight the next player that comes by the gym. Players will be fighting an AI, battles won’t be in real-time. 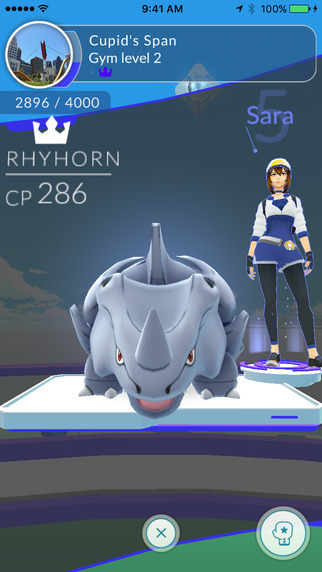 The team that defends the gym can be updated since you can replace your team or teach your Pokemon new moves; the game allows you to teach a Pokemon two moves at a time. Finally, you can stay tuned with our website for more Pokemon GO information and news. We will definitely cover certain Pokemon creatures and plenty of features related to the game. If you want to enjoy one of the best augmented reality experience in the world, then head to the App Store or Google Play and download Pokemon GO! You can watch the trailer for this game below.